135,789. That’s how many subscribers sixteen-year-old West Ryder has on his web vlog series. But he only has eyes for one of them. As one of the internet’s most prestigious video bloggers, West talks about high school relationships under the name “Sam Green.” As far as he knows, no one from school, not even his best friend, Cat, has seen his videos. But the highlight of the whole thing is Harper Knight, who comments every day at exactly 2:02 in the afternoon. He doesn’t know anything about her aside from the occasional deep philosophical messaging on why pizza tastes so delicious, but as stupid as it sounds, he might be falling for her. So when they finally agree to meet in real life, West’s hope for romance seems more and more in reach. But that all changes as soon as he arrives at their meeting spot and sees Cat walking toward him, wearing the same “I ♥ Sam Green” T-shirt Harper promised she'd have on. I know what you're thinking (or at least one of you is thinking. Hi Charlie! ): the story's pretty much summed up in the blurb, right? I want to say wrong but basically, that's what happens. Before you get all judgy and forget about giving this book a shot, I'm telling you GIVE THIS BOOK A SHOT. Why? Because of all the feels. Yes, as simple as that. The feels. The best thing about this book is that it's written in a guy's point of view. I always enjoy books written from a guy's perspective because all the mushy stuff becomes sweeter. When West was starting to realize that he indeed felt something for Cat, it was so heartwarming reading his thoughts and seeing how his feelings developed further. Even though I hated West whenever he'd tell Cat something like, "Promise me you won't try anything?" (tugh. Douchebag) in the end I still loved him as much. West also had to deal with his grief over his mother's death. I appreciate how much detail and thought was put into solidifying parts wherein West would express his sadness. His feelings weren't simply on the surface, it went deep and at some point I felt even more drawn to West because his character became something more than the nerdy/goofy perky guy that he was with Cat/Harper. You have 135,789 subscribers. Did you honestly believe you could keep your vlog a secret? Cat and Harper sound so much alike. You honestly didn't notice? Never wondered....? Then we have Cat. The first thing I liked about her was the fact the she knew what she wanted (West) and she went after it (persistently). Girl power! And pffft you're bestfriends, it's almost always bound to happen. I also liked how fun and quirky she was. She was just right for West because she somehow balanced his life and it showed. I definitely loved how their love story developed. Yes, it became frustrating whenever West would feel really into her one minute but draw back so quickly the next. West was only using his head to make a decision about him and Cat. I happen to appreciate parts wherein West would be thinking about his situation with Cat and whether or not he should go with it. I really think they were well written because I was able to understand fully how West was feeling. He had good reasons for being reluctant. But in the end.... well you get how it goes. I just wish there was more vlog action, specifically the less dramatic, less emotional kind. The book screams "Vlog!" from the title, to the cover, to the blurb. It would've been great to get an idea of who Sam Green was and why he's 135,789-subscribers popular. Click to Subscribe was a fast, fun and heartwarming read that will have you grinning and gushing and feeling from beginning to end. I'm L.M. but you can call me Liam. I'm a YA author, a publishing intern, and a lover of all things reading (and chocolate). 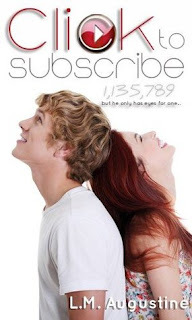 My debut, a YA romance titled Click To Subscribe, releases in April 2013. This sounds really good. Awesome review. Thanks for the mention, Sab. Haha! I'm really glad there's so much more.I would definitely read this. Next thing I'll say is that I want this to be a webseries.